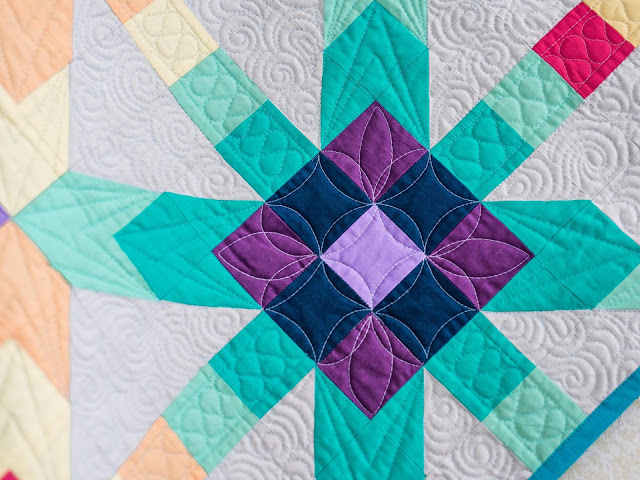 Slice of Pi Quilts: Iridescence quilt featured on the Midnight Quilt Show! 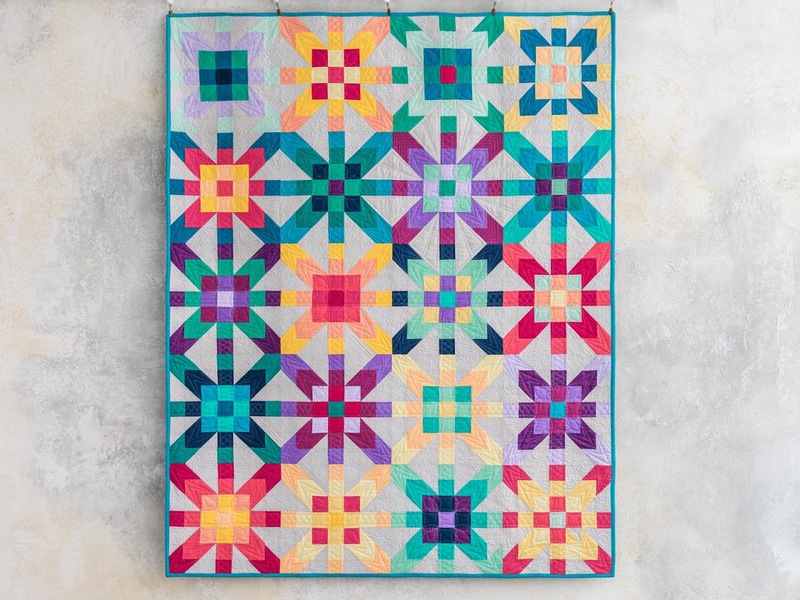 Iridescence quilt featured on the Midnight Quilt Show! Eight months ago, Craftsy asked if I would write a pattern for them. The quilt was named "Iridescence" and would be featured on The Midnight Quilt Show with Angela Walters. Well, fast forward to this week, and it's finally time I can share with you! For this quilt, an in-house designer for Craftsy created the design, I only wrote the pattern. So I do not own the rights to the pattern, and will not be selling it on my own. So if you like it, you better get it while it's available! The quilt was featured on the Midnight Quilt Show this week. Angela shares lots of tips and tricks in the episode (watch it here). There's even a bonus clip with a great piecing tip for sewing blocks with lots of pieces together (watch it here). I will add, the quilt requires half square triangles. If you haven't tried a Bloc-Loc ruler for trimming those up yet, NOW is the time!! Angela doesn't mention it in the video (because Craftsy doesn't sell them), but the 2 1/2" Bloc-Loc ruler will save you a ton of time when trimming them! I'd highly recommend a set of a few common sizes. They are amazing! I did not make this quilt, but Angela sews and quilts it in her show! You can get the Iridescence pattern on it's own here, or you can buy a kit that comes with the pattern and all the Boundless solids fabric you need for the top and binding here. I definitely recommend the kit! 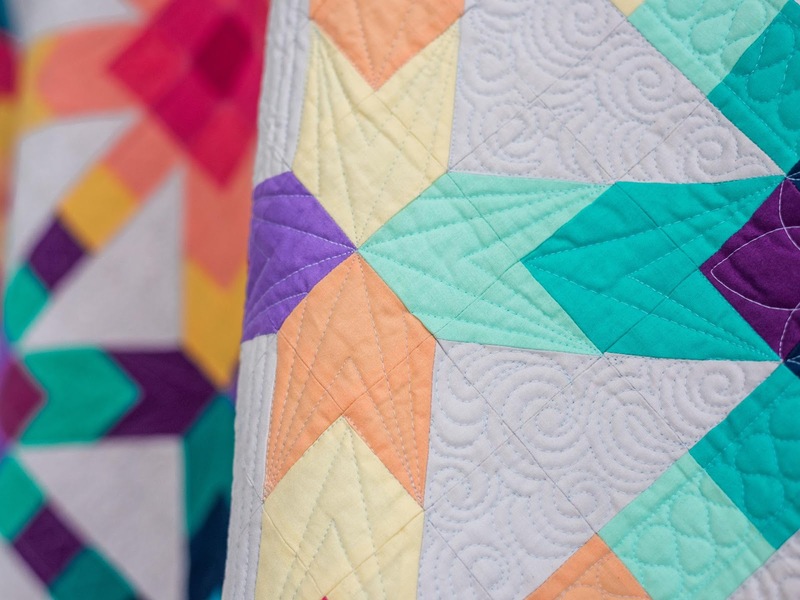 The quilt is fat quarter friendly and the pattern includes a chart to easily keep track of which fabric goes where when making all the blocks. 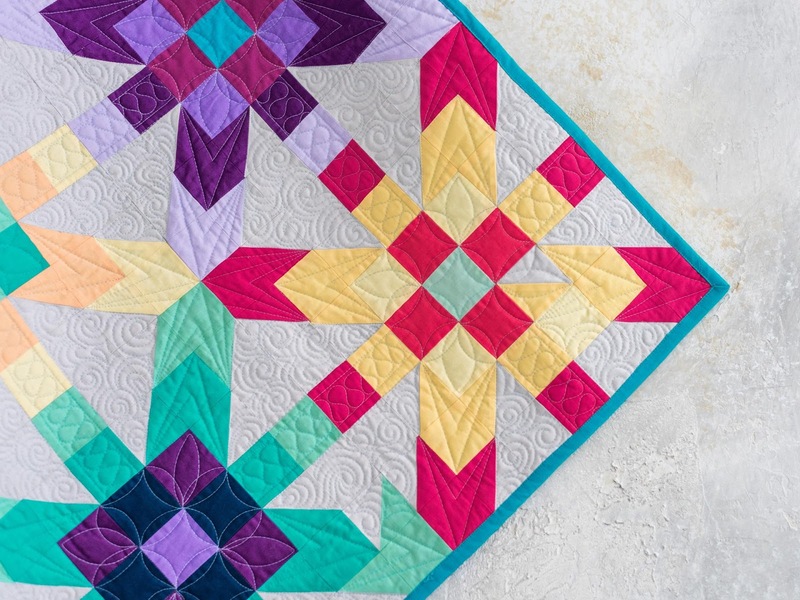 I love that Craftsy used this shot to promote the quilt on their website! Do you spot the mistake in this corner block?? There are actually three blocks in the sample quilt with piecing errors. (The quilt that Angela makes and quilts in the video does not have these errors, but has two different ones!) Proof that finished is better than perfect!! Let me know if you make the Iridescence quilt! I'd love to cheer you on and see your finished quilt! All photos are property of Craftsy. It's really a beautiful pattern! Lots of people have been raving about the Bloc Loc rulers lately, so I bit the bullet and purchased the 6.5" one. Do you think I can use it for smaller blocks, too? I use my 6.5 ruler for smaller ones, no problem. I want to get the biggest size now, but I'm waiting for some birthday money or something! So much fun to be on Angela’s show! It is funny about the different mistakes - and how easily or hard they are to see - depending on who you are. Going to watch her video when binding today - it is always a hoot. Iridescence is stunning, I love it! Congratulations. I have a Bloc Loc and I agree they're totally brilliant, I get such perfect HSTs. Good luck with your move, finding and enjoying the new Batiks. Enjoy and love the new baby. This is a really bright, pretty quilt. I use a Bloc Loc and I love it. I have a 4.5" square and a 1.5" x 3" flying geese. I need to get a couple of bigger sizes. Congratulations - how fun to have our pattern used this way. Awesome! 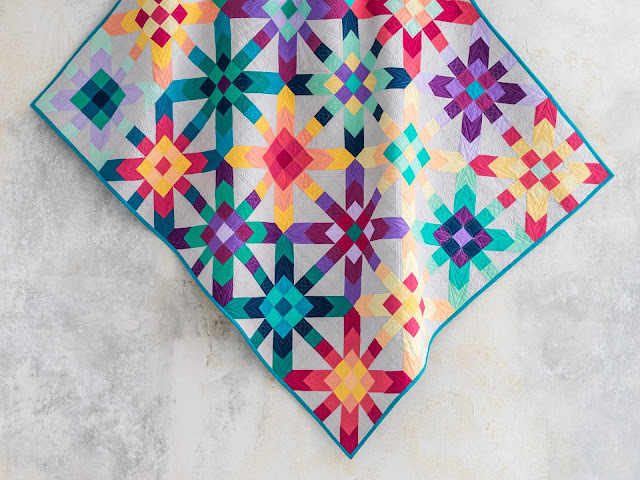 I was looking at the pattern on Craftsy, and don't see what size the quilt is??? Also, how many different fabrics/fat quarters do you need? I have a bunch of solids I would like to use, and this pattern would be great! A stunning quilt!!! You designed a beauty. You and Angela make a rocking team! I have the bloc loc ruler and it's amazing, yes worth every penny. I do find that not everyone carries it. I find Craftsy rarely has the supplies that I need, but I do love their site nonetheless. Quilting Dream Come True: I Bought a Longarm! An Island Batik Christmas in July! My Chambray Quilt is in Quilty Magazine!